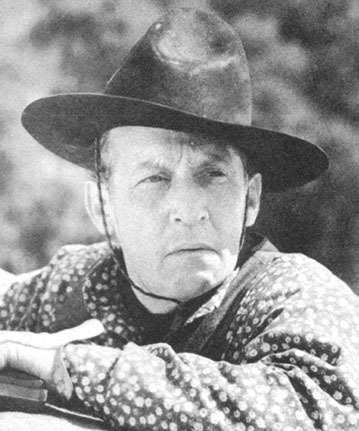 Above: Raymond Hatton in a still from the “Three Mesquiteers” feature New Frontier (Republic, 1939). With a face like a cunning and disreputable turtle, a voice like a rusty gate, and a lovably roguish screen personality, Raymond Hatton had few peers when it came to playing grizzled Western sidekicks. Hatton was most typically cast as shrewd and capable old scouts, characters who provided comic relief through mild rascality and good-humored sarcasm, not bumbling incompetence. The Western stars that Hatton sidekicked for included Robert Livingston, Buck Jones, John Wayne, and Johnny Mack Brown; he had worked with each of those heroes in serials before teaming up with them in features. Raymond Hatton was born in Red Oak, Iowa and grew up in Des Moines. As a boy, he put on plays in his family’s barn; by the time he reached his teenage years he had risen from water boy to usher to actor at a local theater. After finishing high school, he launched his stage career in earnest, touring with several Western and Midwestern theatrical companies before marrying and settling in Los Angeles in 1911. In 1912, he began his movie career as a member of comedy producer Mack Sennett’s stock company. He honed his comic talents in multiple Sennett shorts (beginning with Oh, Those Eyes) over the next two years, and then began to play a wide range of character parts in other productions. From 1914 to the mid-1920s, he appeared in more than twenty of Cecil B. DeMille’s silent films, the most notable being the 1918 drama The Whispering Chorus, which gave Hatton one of his few starring roles. In 1926, Hatton partnered with Wallace Beery to star in the silent comedy We’re in the Navy Now; the Beery-Hatton team would star in half-a-dozen other features before the end of the silent era. The coming of sound limited Hatton’s range of roles: the silent era had seen him as everything from the Aztec emperor Montezuma in DeMille’s The Woman God Forgot to the Parisian rogue Gringoire in The Hunchback of Notre Dame, but his Iowan drawl relegated him mainly to Westerns once sound arrived. 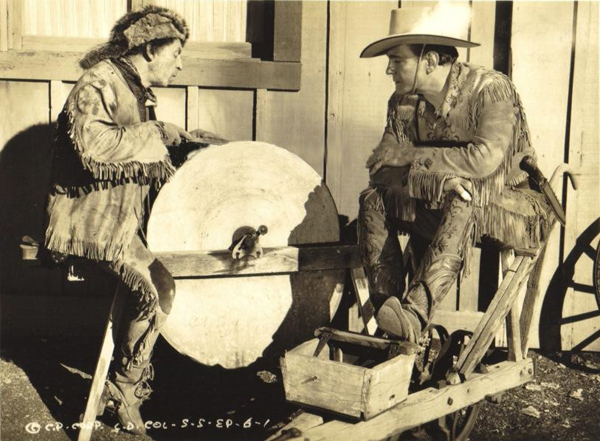 The difficulties inherent in taking sound equipment on location in turn relegated Westerns to the realm of the cost-cutting producer, and Hatton’s stock as an A-list character actor quickly began to drop as he appeared in more and more B-westerns during the early 1930s. During this time, he began developing his Western sidekick persona in medium-budgeted Tom Mix films like Hidden Gold and Terror Trail, enlarging upon the comical rascal persona he had developed in his comedies with Beery. Like many other serial player, Hatton’s introduction to the cliffhanger world came at the hands of Mascot Pictures’ producer Nat Levine, who was always on the lookout for well-known actors unable to capitalize on their names. Hatton made his chapterplay debut in The Three Musketeers (Mascot, 1933), a Foreign Legion adventure that bore no real resemblance to the Dumas novel that officially “inspired” it. Hatton was Renard, one of a trio of Legionnaires whose lives were saved by American pilot Tom Wayne (John Wayne) in the first chapter. When Wayne was subsequently framed for gun-running and murder by a mysterious Arab rebel leader named El Shaitan, the three “Musketeers” teamed up to extricate their friend and track down El Shaitan. Musketeers was an extremely likable serial, with exciting action and enthusiastic acting that compensated for its over-complicated plot. Hatton’s performance was something of a final echo of his earlier and more varied character-acting career; his Renard was not the cheerful rapscallion he would play almost exclusively in his later years, but a dignified career soldier who was the most level-headed and responsible of the “Three Musketeers.” Hatton even gave a suitably Gallic twist to his line delivery, successfully downplaying his Midwestern accent. Above, from left to right: Francis X. Bushman Jr., Raymond Hatton, and Jack Mulhall as The Three Musketeers (Mascot, 1933). After appearing in several B-movies (Paramount’s Wagon Wheels, MGM’s Lazy River), as well as Paramount’s bizarre A-film Alice in Wonderland (as the Dormouse), Hatton made the most pivotal film of his sound-era career: a 1935 Universal serial called The Rustlers of Red Dog. In Rustlers, he played a fully-matured version of his signature Western sidekick character, and teamed for the first time with Johnny Mack Brown, with whom he would later co-star in over forty B- westerns. The well-made Rustlers dealt with a running battle between lawman Jack Wood (Brown) and rustler chieftain Rocky (Harry Woods); Jack was aided throughout by a gambler named Deacon (Walter Miller) and a veteran scout named Laramie (Hatton). Laramie was scruffy-looking, a drinker, and something of a ladies’ man, but a valuable ally in combats with outlaws and Indians; Hatton played this endearing rascal with real gusto, interacting memorably with Brown and Miller and stealing plenty of scenes. Much of Hatton’s later career would find him playing variations of his Laramie character, opposite Brown and other cowboy stars. 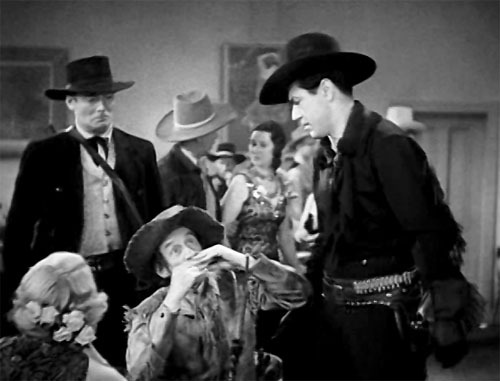 Above: Walter Miller (standing left) and John Mack Brown (standing right) interrupt Raymond Hatton’s attempt to serenade a saloon girl with his harmonica in The Rustlers of Red Dog (Universal, 1935). 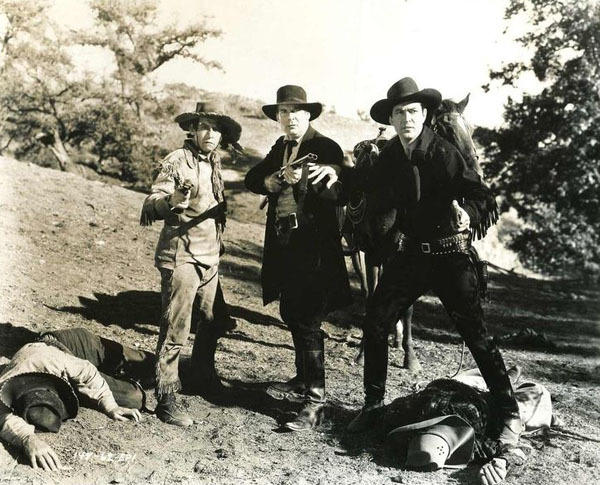 Above, from left to right: Raymond Hatton, Walter Miller, and Johnny Mack Brown in The Rustlers of Red Dog. Nat Levine, now the head of serial production at the newly-formed Republic Pictures, re-hired Hatton in 1936 for a pair of cliffhangers, Undersea Kingdom and The Vigilantes Are Coming. Kingdom, a science-fiction adventure set in the submerged but still-functioning realm of Atlantis, featured Hatton in the offbeat role of Gasspon, a sort of sergeant-major in the forces of the evil Atlantean dictator Unga Khan (Monte Blue). Hatton had little to do in Kingdom but take orders from his superior Lon Chaney Jr. and bark orders at Khan’s soldiery in turn, although he took part in a few military attacks on the good guys’ citadel. His most memorable scene was a bizarre moment in Chapter Six, in which the usually grumpy and no-nonsense Gasspon was briefly seen telling a humorous anecdote about a piccolo player to a fellow-soldier; apparently the camera accidentally caught Hatton relaxing between scenes and the blooper was left in. 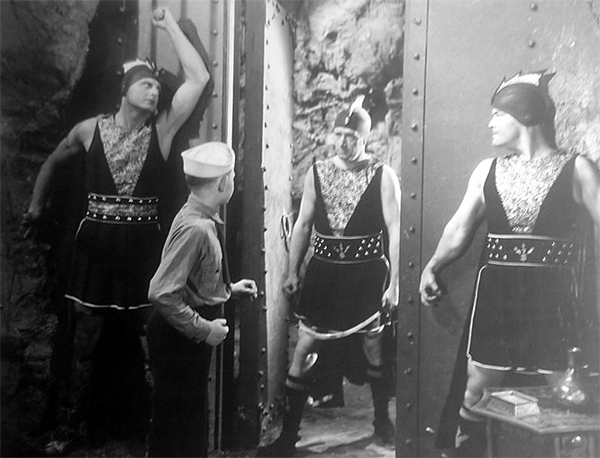 Above: Ray “Crash” Corrigan (far left), Lee Van Atta (in sailor hat), and John Merton (far right) prepare to clobber the unsuspecting Raymond Hatton in Undersea Kingdom (Republic, 1936). 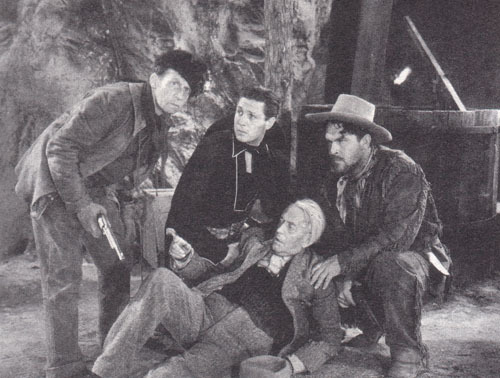 Above, from left to right: Raymond Hatton, Bob Livingston, and Guinn “Big Boy” Williams aid the injured Lloyd Ingraham in The Vigilantes Are Coming (Republic, 1936). Jungle Jim (Universal, 1936), a satisfying and atmospheric cliffhanger based on an Alex Raymond comic strip, featured Hatton as jungle guide Malay Mike. Mike joined with fellow guide Jim Bradley (Grant Withers) in tracking down the murderers of a friend; in the process, they encountered and befriended a lost heiress (Betty Jane Rhodes) who had grown up as the Lion Goddess of a native tribe. They also tangled with a greedy relative after the “Goddess’s” inheritance and a fugitive criminal called the Cobra. Hatton’s impudent, sharp-shooting character was more or less identical to the frontier scouts he’d played in his earlier serials, despite the difference in milieu; he made the jungle-based Mike just as colorful a character as those sagebrush adventurers had been. 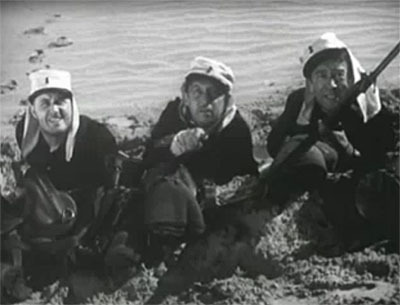 Above, from left to right: Raymond Hatton, Betty Jane Rhodes, and Grant Withers in Jungle Jim (Universal, 1936). 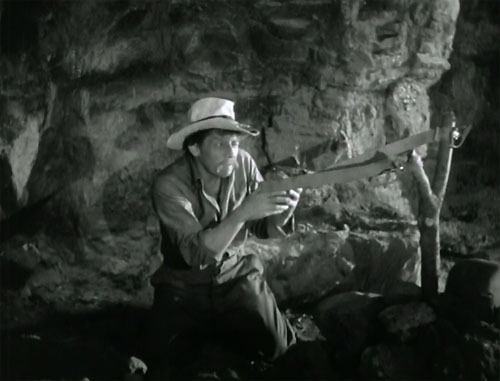 Above: Raymond Hatton fends off natives with an improvised slingshot (created from his suspenders) in Jungle Jim. After playing character parts in a few more Westerns (Arizona Raiders, The Texans) and non-Westerns (Fly Away Baby, Love is on the Air) for Paramount, Warner Brothers, and other studios, Hatton was recruited again by Republic to play sidekick to their new B-western star Roy Rogers. After several turns in early Rogers features like Come On Rangers, Hatton was moved over to Republic’s “Three Mesquiteers” series, then starring John Wayne and Ray Corrigan. Hatton played “Rusty” Joslin, the third Mesquiteer, opposite the Wayne/Corrigan team and then opposite their series replacements Robert Livingston and Duncan Renaldo. Hatton left the Mesquiteers series and Republic in late 1940, and appeared in his final serial–Columbia’s White Eagle–early in 1941. This Western chapterplay, a melange of action and comedy directed by James W. Horne, featured Hatton as a scout named Grizzly who helped Pony Express rider and adopted Indian “White Eagle” (Buck Jones) fight a profiteer who was trying to start an Indian war. Hatton, undoubtedly with the blessing of Horne, played Grizzly in excessively cartoonish fashion as a boastful, bumbling, and bombastic old codger, light-years removed from the canny and subtly characterized sidekicks he had played in earlier serials and B-westerns. Hatton, however, seemed to enjoy the change of pace, and hammed his way outrageously through the serial. Above: Raymond Hatton and Buck Jones in White Eagle (Columbia, 1941). Hatton rejoined Buck Jones at Monogram Pictures shortly after White Eagle’s release; they teamed with Tim McCoy to form a new cowboy trio called the Rough Riders for popular series of B-westerns. Jones’ death and McCoy’s Army enlistment ended the series in 1942; in 1943 Monogram partnered Hatton with Johnny Mack Brown in a new series–although Hatton retained the character name of “Sandy Hopkins” from his Rough Riders films. Hatton spent the rest of the 1940s playing Sandy or other sidekick characters opposite Brown, only occasionally taking a role in other productions–among them the John Wayne A-western Tall in the Saddle and Cecil B. DeMille’s Unconquered (in which DeMille gave his former star Hatton a memorable cameo). Hatton’s final film with Brown was 1948’s Hidden Danger; he then finished his career as a regular B-western sidekick by appearing in support of Jimmy Ellison and Russell Hayden in six features for Lippert Productions. The 1950s found Hatton playing character roles in a few features but working chiefly on TV series–The Gene Autry Show, The Adventures of Wild Bill Hickock, The Adventures of Superman, Cheyenne, Maverick, and many others. He worked steadily in TV until 1961, then went into semi-retirement, making occasional appearances in television and features until 1967; his last screen appearance was a bit as a hitchhiker in 1967’s In Cold Blood. He passed away in Palmdale, California, in 1971. Though he could often be very funny, Raymond Hatton was more character actor than pure comedian in his serial and B-western work; his sidekicks were not mere collections of cartoonish mannerisms, but full-blooded and interesting personalities. Hatton made his characters seem uneducated but very wise in the ways of the world; with one slow wink or deliberately-drawled “waaal,” he could vividly suggest the lifetime of checkered experience that seemed to lie behind redoubtable sidekicks like Malay Mike, Whipsaw, and Laramie. 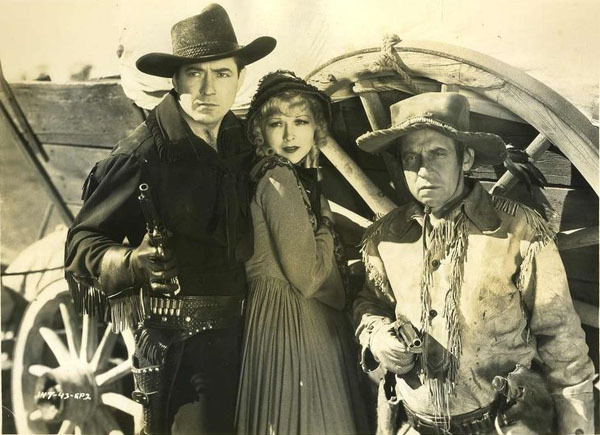 Above: Johnny Mack Brown, Joyce Compton, and Raymond Hatton in The Rustlers of Red Dog (Universal, 1935). Acknowledgements: For the information on Hatton’s early years, I’m indebuted to the Des Moines Register’s online article on him. Really enjoyed your piece on my great uncle, Raymond Hatton. Over the years I’ve tried to amass as many of his appearances on film and TV as possible, resulting in a crammed six foot tall bookshelf of DVDs and VHS tapes. I’d need a whole other shelf if I could locate all the silents he appeared in. So far, with the help of a creative editor friend, I’ve compiled four themed DVDs, featuring Ray as con men, judges, drunks (he never drank, my mom tells me), and gangster goons, among others. My recent collection focused on just a small selection of his television appearances. I make a copy for myself, one for my brother, and three for our first cousins so all their kids have a crack at appreciating Ray’s HUGE volume of material (over 400 listings on IMDB). Next, it’ll be either his silent efforts (such as are available) or a sampling of his Johnny Mack Brown pictures. So, again, thanks for such a well-informed and well-rounded look at Ray’s career in serials (imagine my delight when “Jungle Jim” first became available a few years back!). By the way, I’ve been able to round up all but ONE of his Johnny Mack Brown pictures. I’m still missing “Haunted Mine.” Any leads you can offer? My email is mrbuick55@hotmail.com. It refers to Ray’s old Buick that I’ve restored and still enjoy driving.